Consumer spending over the all-important festive period was weaker than expected according to the latest retail sales figures which showed a drop of 0.9% month-on-month for December. The decline once more highlighted the customary post-Black Friday slump with the drop coming after a rise of 1.3% in November. 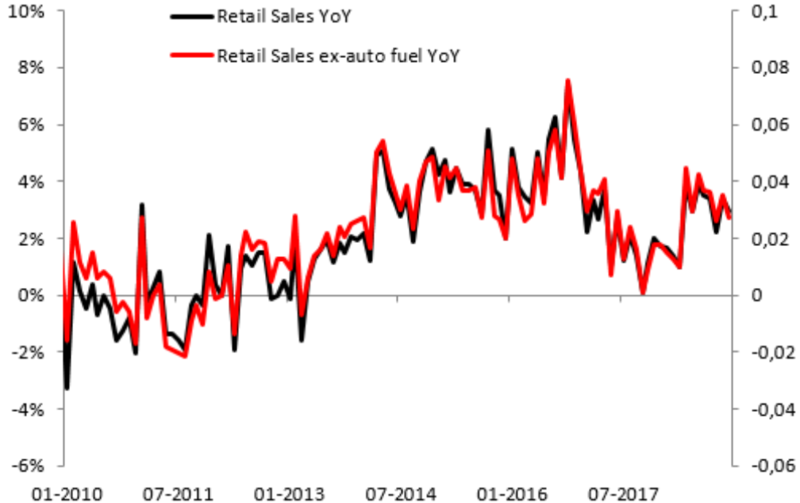 If we take out car sales and fuel then the figures make for even worse viewing, with the decline of 1.3% M/M, well below the 0.6% drop forecast and in fact the worst print for this metric since May 2017. The pound has shown little reaction to the news however, as it remains lower on the day against most of its peers after a solid push higher during Thursday’s session. At the end of what has been one of the most tumultuous weeks in British politics since the EU referendum in 2016, it is perhaps telling that the pound has gained against all of its peers and with the markets seemingly pricing out the chances of a no deal Brexit, there is scope for further gains going forward - unless we get a nasty shock on this front. Carmaker Tesla has announced that it will cut its full-time workforce by around 7% while it ramps up production of its Model 3 sedan. "Higher volume and manufacturing design improvements are crucial for Tesla to achieve the economies of scale required to manufacture the standard range (220 mile), standard interior Model 3 at $35k and still be a viable company," the electric carmaker said. The job cuts are just part of various cost-cutting measures implemented by Tesla of late, with the firm looking to boost margins to aid in its push to ramp up production of the Model 3. Shares in Tesla have experienced some pretty big swings in recent months but overall they have made a good start to the New Year, ending Thursday’s session around the $350 mark after changing hands below $300 at the start of the month.